ECG/EKG was easily the new Apple Watch’s most lauded feature. It’s also been the most delayed. Of course, this kind of serious health feature is the sort of thing you need to get exactly right, for reasons that ought to be pretty obvious on their face. Electrocardiogram finally goes live today for Series 4 owners as part of the watchOS 5.1.2 update. It’s an important feature — and one that will go a ways toward helping establish the wearable as a more serious health monitor. The new feature builds on a hardware upgrade built into the Series 4: a pair of electrodes built into the larger back crystal on the rear of the watch and the digital crown. Once enabled, the new feature is checking for a couple of key bits of heart health: irregular heart rhythms, which the watch will passively monitor in the background, and ECG, which requires the user to actively engage with by completing the circuit with a finger tip placed on the edge of the watch’s digital crown. Of course, getting all of this isn’t as simple as just installing a software update. There is, understandably, a pretty long opt-in here. 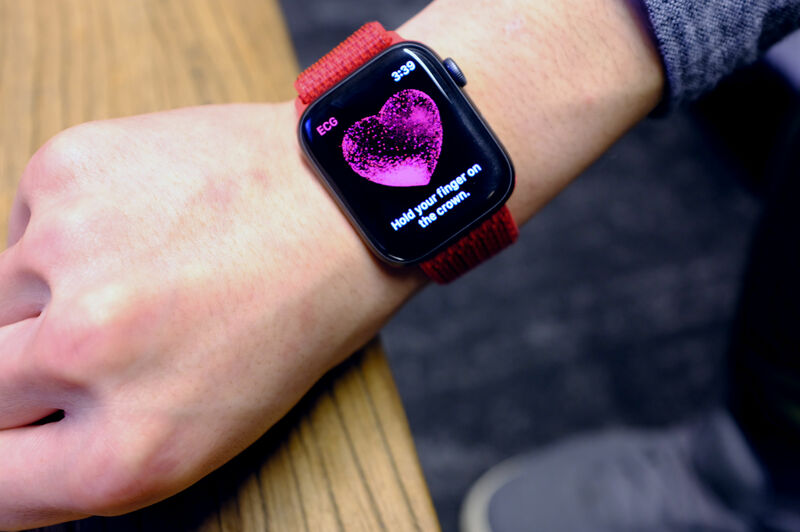 The on-boarding process is several pages long for both of the new features, as Apple collects some vital information and repeatedly reminds you of some important information — like the fact that the watch can’t detect a heart attack. If you feel like you might be having one, call the emergency services. The Apple Watch isn’t meant to replace a doctor either, of course. Really, it’s just a way to monitor for complications. 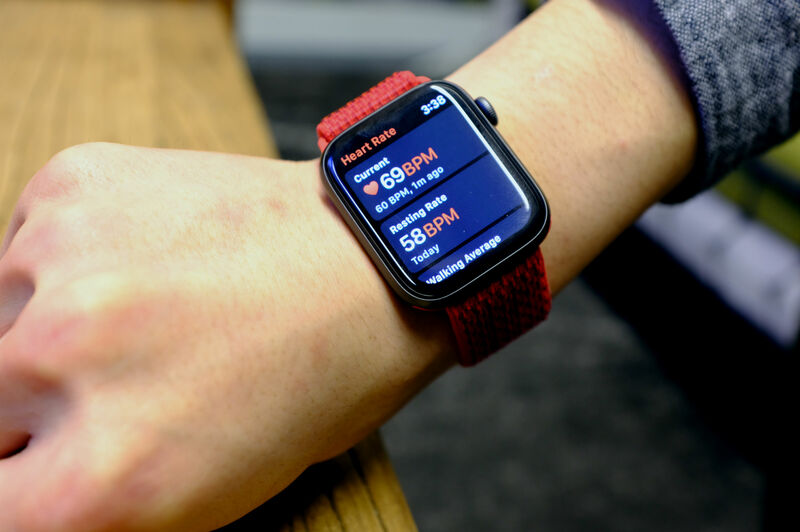 If the smartwatch can be regarded as a potential lifesaver or even peripheral medical device, it’s due to the fact that it features a kind of always-on monitoring. After all, outside of the proliferation of these sorts of wearables, most of us won’t experience something like constant ECG monitoring until under the care of a doctor. If this feature is capable of isolating that information ahead of time, it could go a ways toward addressing complications before they turn into major issues. The sign-up process airs on the side of caution, while attempting to not overwhelm the end user with information. It’s a tricky balance, and if TOS have taught us anything, it’s that too much information upfront will ultimately result in the user’s eyes glazing over. In the case of this information, that could potentially lead to serious consequences if not properly adhered to. That last one is particularly important when distinguishing between the new features. While heart rhythm detection is a feature, the Watch isn’t regularly looking for atrial fibrillation. That’s where the ECG app and the finger detection come in. The feature is intended to be used when the heart rhythm monitor detects that something is off — like a skipped or rapid heartbeat. In which case, it will send a notification right to your wrist. If that happens, fire up the ECG app, rest your arm on your lap or a table and hold your finger to the crown for 30 seconds. Apple will display a real-time graph of your heart rhythm while you wait. It’s strangely soothing, honestly, though Apple doesn’t recommend using the feature with much regularity, unless you have cause to. Using it just now, I got a “This ECG does not show signs of atrial fibrillation” note, meaning the reading falls within the parameters of a sinus rhythm. Your heart’s job is to pump blood to your body. When it’s working the way it should, it pumps to a regular, steady beat. This is called a normal sinus rhythm. When it’s not, you could have an irregular heartbeat called AFib. So, good. No need to call the doctor. If you’re still feeling unwell, however, there’s a quick link to dial emergency services on the screen. There’s also a spot for adding any symptoms you might be having if you’re feeling less than 100 percent. And while Apple promises not to share any of the info collected on-device, you can always export your findings to a PDF for your doctor to take a gander at. Along with the new feature comes a new White Paper, detailing the technology. It’s an usual bit of transparency from Apple, but the company understandably wants to be as upfront about the technology as possible. The paper details a lot of what went into bringing the feature up to speed for general availability. 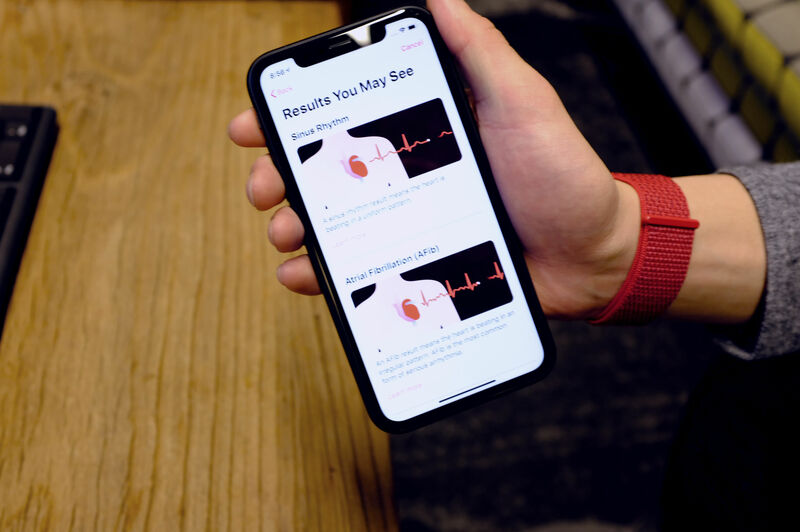 Apple started with a pre-clinical study of 2,000 subjects, including ~15 percent who have been diagnosed with heart arrhythmia. Six-hundred subjects were then involved with the clinical trial to validate the AFib. In addition to that testing, the company has also employed a number of medical doctors to help ensure the product meets the sort of exacting standards one would hope from a product like this. More information on the research can be found in this Stanford partnered paper published earlier this month.